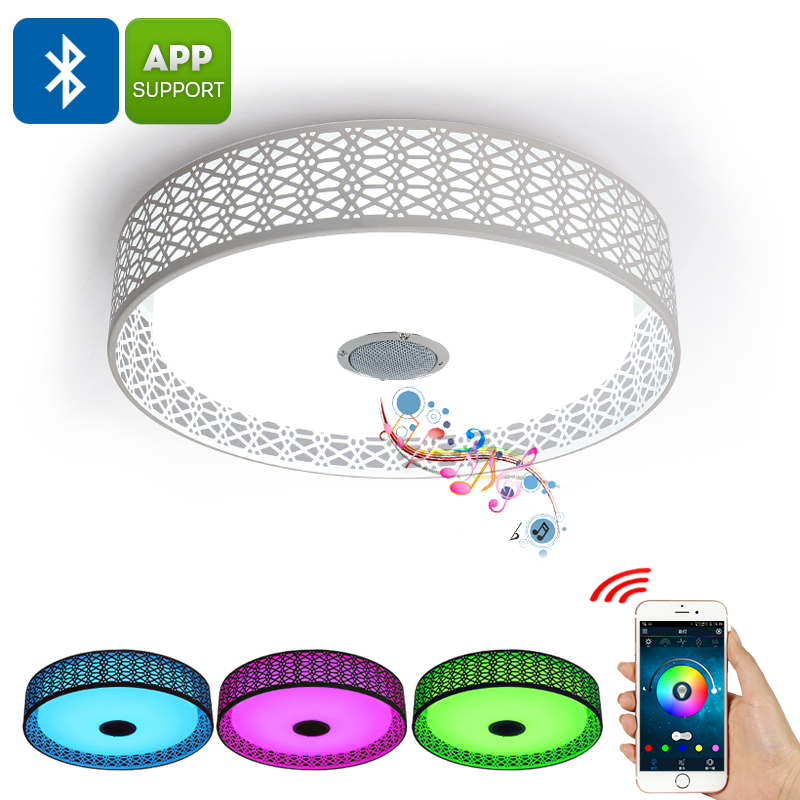 Successfully Added Bluetooth LED Ceiling Light - Play Music, Bluetooth Connection, Mobile Application, 36W, 3000 Lumens, Millions of Colors to your Shopping Cart. Enlighten your life and spice up your furniture with this fashionable Bluetooth LED Color Light that plays music. With its modern design this unique LED ceiling light forms the perfect decoration for any living room and bedroom alike. The possibility to play music and switch in between millions colors of light make this a truly unique device that is guaranteed to live up to your expectations. When paired with your Bluetooth enabled device you can simply control your music and adjust the color of the light emitted as to suit your current mood. The Bluetooth LED ceiling light comes with 20 pre-programmed lighting effects such as cross-fade and strobe. Additionally the mobile Application allows you to create your own light effects that are guaranteed to bring along hours of mesmerizing fun and entertainment. The possibility to play music through its built-in speakers make this RGB Color light truly unique. Delivering a stunning 360 surround effect this Bluetooth LED color light provides an audio experience fit for any audiophile out there. No longer will there be the need to play music through a separate stereo device that has been wired to numerous of speakers. With this music playing Bluetooth ceiling light you will be able to enjoy all your favorite tracks by simply browsing through your smartphone music library. Whether you use it in your living room to spice up your furniture, or place it in your children’s bedroom it to create a unique world of fairy tales – this Bluetooth LED color light is a true treasure that is guaranteed to spice up your life. Select from the million plus different light colors, apply different lighting effects, and play music. With this stylish and unique Bluetooth LED ceiling light the possibilities are endless. This Bluetooth LED color light comes with a 12 months warranty, brought to you by the leader in LED lights as well as wholesale electronic gadgets..
Arabic: - مصباح RGB - Chinese Simplified: - RGB 灯 - Czech: - RGB lampa - Dutch: - RGB-Lamp - French: - Lampe RGB - German: - RGB Lampe - Hebrew: - המנורה RGB - Hindi: - RGB दीपक - Hungarian: - RGB lámpa - Italian: - Lampada RGB - Japanese: - RGB ランプ - Korean: - RGB 램프 - Malay: - Lampu RGB - Norwegian Bokmål: - RGB-lampe - Romanian: - Lampă de RGB - Russian: - RGB лампы - Spanish: - Lámpara RGB - Thai: - ไฟ RGB - Turkish: - RGB lamba - Vietnamese: - Đèn RGB.